Ultrasonic welding machines can be used for various functions such as component welding, spot-welding, riveting, swaging, inserting and de-gating mouldings. We design and manufacture a wide range of ultrasonic tools (sonotrodes/horns) with varying frequencies for all makes of machines, suitable for all welding applications. Our spin welding machines have been developed over the years through our extensive and professional experience incorporating a group of features. In partnership with CEMAS Elettra we are able to supply vibration welders which come in a range of sizes suitable for various components. We produce and supply an extensive range of thermoplastic welding machines and equipment specialising in ultrasonic welders (standard & special purpose), spin welders, infrared & hot plate welders, vibration & welders plus ultrasonic tooling in a wide range of frequencies, location fixtures and servicing. We are engineers first, and our aim is to ensure your end product is right. We want you to get the right welding process, the right machine and the right tooling to get the perfect welding result for your customer. We were established in 2002 and have more than 90 years combined experience with our in-house team of engineers. With our apprenticeships, we are also looking to the future by investing in the next generation of welding engineers. We have extensive quality systems and are ISO 9001 accredited. So you can be certain of a quality product. We are constantly investing in the latest technology, control systems, CAD, and in-house manufacturing tools and even exploring robotics to ensure we can give you cutting edge solutions to your welding needs. 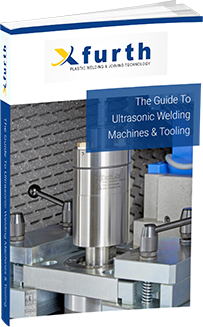 This guide tells you everything you need to know about Ultrasonic Welding Machines & Tooling. A set of LH & RH ultrasonic welding sonotrodes and nests for a customer in Mexico. At X Furth, we like to share the work that we have done for our customers. This latest piece was for a set of LH & RH ultrasonic welding sonotrodes and nests for one of our customers in Mexico.